A method for building a greenhouse on a small, airless body. Now he started unrolling great bolts of a transparent, wire-strengthened plastic. Patching with an adhesive where explosion-rents had to be repaired, he cut hundred-yard strips, and, with Rose's help, laid them edge to edge and fastened them together to make a continuous sheet. Next, all around its perimeter, he dug a shallow trench. The edges of the plastic were then attached to massive metal rails, which he buried in the trench. "Sealed to the ground along all the sides, Honey," he growled to Rose. "Next we fit in the airlock cabinet, at one corner. Then we've got to see if we can get up enough air to inflate the whole business. That's the tough part—the way things are...."
After the massive airlock was in place, they attached their electrolysis apparatus to the small atomic battery, which had been used to run the well-driller. The well was in the area covered by the sheet of plastic, which was now propped up here and there with long pieces of board from the great box. Over their heads, the tough, clear material sagged like a tent-roof which has not yet been run up all the way on its poles. From Asteroid of Fear, by Raymond Z. Gallun. Sometimes John Endlich was misled. Sometimes, listening to familiar sounds, and smelling familiar odors, toward the latter part of his reprieve, he almost imagined that he'd accomplished his basic desires here on Vesta—when he had always failed on Earth. There was the smell of warm soil, flowers, greenery. He heard irrigation water trickling. The sweetcorn rustled in the wind of fans he'd set up to circulate the air. Bees buzzed. Chickens, approaching adolescence, peeped contentedly as they dusted themselves and stretched luxuriously in the shadows of the cornfield. For John Endlich it was all like the echo of a somnolent summer of his boyhood. There was peace in it: it was like a yearning fulfilled. An end of wanderlust for him, here on Vesta. In contrast to the airless desolation outside, the interior of this five-acre greenhouse was the one most desirable place to be. 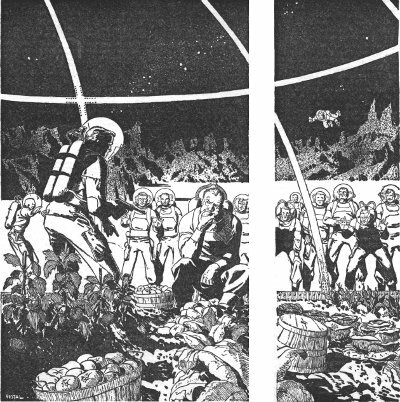 Compare to the Lunar Greenhouse Tunnel from The Moon is a Harsh Mistress (1966) by Robert Heinlein. - Are Human Settlements On Asteroids Possible?